The most common Obama-to-Trump voter is a white American who wants government intervention in the economy but holds negative views toward minorities. Photo illustration by Natalie Matthews-Ramo. Photos by Menahem Kahana/Getty Images and Nicholas Kamm/AFP/Getty Images. It has been more than seven months since less than a plurality of Americans put Donald Trump into the White House, and we are still grappling with how it happened. * How should we understand the forces that gave Trump the election? 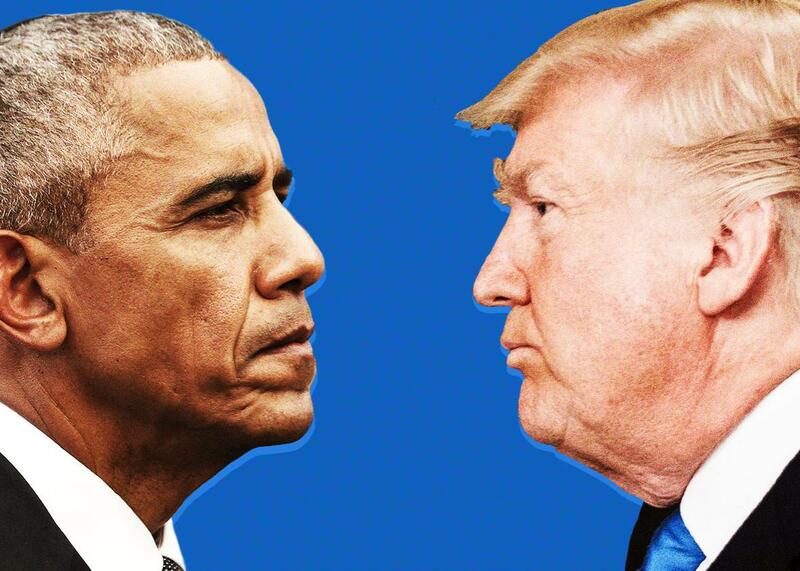 A new data set moves us closer to an answer: in particular how to understand the voters who supported Barack Obama in 2012 only to back Trump in 2016. Its lessons have far-ranging implications not only for diagnosing Trump’s specific appeal but for whether such an appeal would hold in 2020. Two reports from the Voter Study Group, which conducted the survey, give a detailed look at these vote switchers. (You can learn more about the nonprofit survey here—what’s key is that its longitudinal nature allows researchers to draw deeper conclusions on the issues that motivated voters.) One, from George Washington University political scientist John Sides, looks at racial, religious, and cultural divides and how they shaped the 2016 election. The other, from political scientist Lee Drutman, takes a detailed look at those divides and places them in the context of the Democratic and Republican parties. Starting in different places, both Sides and Drutman conclude that questions of race, religion, and American identity were critical to the 2016 outcome, especially among Obama-to-Trump voters. That’s no surprise. What’s interesting is what the importance of identity says about Donald Trump’s campaign. Put simply, we tend to think that Trump succeeded despite his disorganized and haphazard campaign. But the Voter Study results indicate that Trump was a canny entrepreneur who perceived a need in the political marketplace and met it. Whether or not they identified with a party, most people who voted in the 2016 election were partisans. “Approximately 83 percent of voters were ‘consistent partisans,’ ” writes Sides. In other words, they voted for the same major party in both 2012 and 2016. This is the typical case. But about 9 percent of Donald Trump’s voters had backed Obama in the previous election, equivalent to roughly 4 percent of the electorate. Why? The popular answer, or at least the current conventional wisdom, is economic dislocation. But Sides is skeptical. He concludes that economic issues mattered, but no more or less than they did in the 2012 election. The same goes for views on entitlement programs, on trade, and on the state of the economy in general. The weight of those issues on vote choice was constant between the two election years. What caused this shift in the salience of race and identity (beyond the election of a black man in 2008) and augured an increase in racial polarization? You might point to the explosion of protests against police violence between 2012 and 2016, and the emergence of Black Lives Matter, events that sharply polarized Americans along racial lines. And in the middle of 2015 arrived the Trump campaign, a racially demagogic movement that blamed America’s perceived decline on immigrants, Muslims, and foreign leaders, and which had its roots in Donald Trump’s effort to delegitimize Barack Obama as a noncitizen, or at least not native-born. But the fact that Trump primed and activated racial views doesn’t immediately mean those white Obama voters acted on them. Which brings us to Drutman’s analysis of the Voter Study Group. Drutman plots the electorate across two axes—one measuring economic views, the other measuring views on identity—to build a political typology with four categories: liberals, conservatives, libertarians, and populists. Liberals, the largest single group, hold left or left-leaning views on economics and identity. Libertarians, the smallest group, hold right-leaning views on economics but leftward beliefs on identity. Conservatives are third largest, with right-leaning views on both indices, while populists—the second largest group—are the inverse of libertarians, holding liberal economic views and conservative beliefs on identity. This is a portrait of the most common Obama-to-Trump voter: a white American who wants government intervention in the economy but holds negative, even prejudiced, views toward racial, ethnic, and religious minorities. In 2012, these voters seemed to value economic liberalism over a white, Christian identity and backed Obama over Romney. By 2016, the reverse was true: Thanks to Trump’s campaign, and the events of the preceding years, they valued that identity over economic assistance. In which case, you can draw an easy conclusion about the Clinton campaign—even accounting for factors like misogyny and James Comey’s twin interventions, it failed to articulate an economic message strong enough to keep those populists in the fold and left them vulnerable to Trump’s identity appeal. You could then make a firm case for the future: To win them back, you need liberal economic populism. But there’s another way to read the data. Usually, voters in the political crosscurrents, like Drutman’s populists, have to prioritize one of their chief concerns. That’s what happened in 2008 and 2012. Yes, they held negative views toward nonwhites and other groups, but neither John McCain nor Mitt Romney ran on explicit prejudice. Instead, it was a standard left vs. right ideological contest, and a substantial minority of populists sided with Obama because of the economy. That wasn’t true of the race with Trump. He tied his racial demagoguery to a liberal-sounding economic message, activating racial resentment while promising jobs, entitlements, and assistance. When Hillary Clinton proposed a $600 billion infrastructure plan, he floated a $1 trillion one. When Clinton pledged help on health care, Trump did the same, promising a cheaper, better system. Untethered from the conservative movement, Trump had space to move left on the economy, and he did just that. For the first time in recent memory, populist voters didn’t have to prioritize their values. They could choose liberal economic views and white identity, and they did. The good news for Democrats—and the even better news for the populist left—is that unless Trump makes a swift break with the Republican Party, his combined economic and identity-based appeal was a one-time affair. In 2020, if he runs for re-election, Trump will just be a Republican, and while he’s certain to prime racial resentment, he’ll also have a conservative economic record to defend. In other words, it will be harder to muddy the waters. And if it’s harder to muddy the waters, then it’s easier for Democrats—and especially a Democratic populist—to draw the distinctions that win votes.